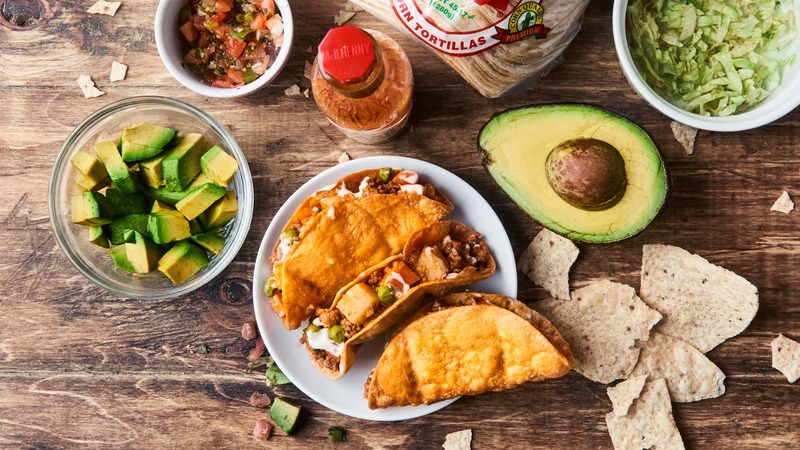 Turn fresh tortillas into hard taco shells by deep frying them! Give this tip a try with this recipe for Picadillo Tacos. Once hot, add beef and cook, breaking it up as you go for 5 minutes. Add in potatoes and cook an additional 5 minutes, stirring occasionally. Add in onion and carrot and cook for another 5 minutes. Stir in peas, tomato sauce, water, TABASCO®, and salt. Season with more salt, if necessary. Fill large saucepan with 2 inches of vegetable oil. Create a small cylinder (about 1/2 inch thick) with tin foil. Fold mini tortilla around cylinder to create a taco shape. Hold together with metal tongs. Lower tortilla into oil and fry for about 30-60 seconds, or until tortilla starts to hold it’s shape. Remove tortilla from oil and carefully (using the tongs) remove the foil cylinder. Place tortilla back into the hot oil and continue frying until golden brown, about an additional60 seconds. Remove from oil, place onto a cooking rack lined with paper towels and season with a pinch ofsalt. Fill fried taco shells with the picadillo and top with crema, avocado, lettuce, and pico de gallo!